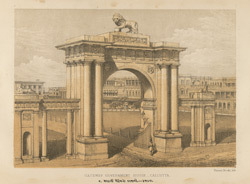 Lithograph of the Gateway of Government House at Calcutta by Vincent Robert Alfred Brooks (1814-85) from one of 'Eight views of Calcutta' published in London c.1870. When Marquis Wellesley became Governor-General of Calcutta in 1798, he decided that the existing Government House was not a suitable building for his position and needs. The architect of the new Government House was Captain Charles Wyatt of the Bengal Engineers. Four large ceremonial gateways marked each end of the carriageways on the north and south façades. They are based partly on Robert Adam's archways at Syon House in Middlesex. A lion with one of its paws holding onto a ball tops the central section of the gateway. The smaller sections on each side are linked to the centre by a short colonnade and topped with sphinx. Although the sphinx were originally made of teak, they were replaced by cement when the wood cracked.